ThemeParkMama: Are you ready for Valentines Day...No Worries Oriental Trading has you covered! Are you ready for Valentines Day...No Worries Oriental Trading has you covered! Having 5 kids and 4 of which are in school and 3 which participate in giving of Valentines, everything adds up and fast. Nowadays at schools the classes taught by two teachers making for more kids avg of 36 between the two classrooms, so you do the math that is at least 108 kids to get a little something for...WOW. Thank goodness for Oriental Trading. They are my go to for any holiday, or occasion and sometimes just for fun. 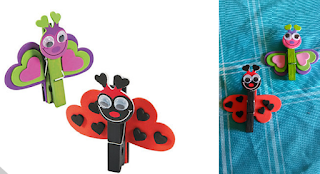 Love Bug Clothespin Craft Kit: These clothespin craft kits for kids are great craft supplies to have on hand for rainy day fun! Easy to make and fun to do, they're a wonderful craft activity to do with your children. These magnet craft kits also make great classroom art supplies - they're simple and a fun way to reward kids for good behavior. The finished product makes a handmade keepsake that parents will treasure for years. Includes self-adhesive foam pieces, googly eyes and wooden clothespins. 3 1/4" x 3 1/2" All craft kit pieces are pre-packaged for individual use. Kits include instructions and extra pieces. Makes 12. © OTC. I loved how simple these were to make, everything was a sticker, so it made for a easy clean up, and a break for me because my daughter who is 4 could put together with no help needed. 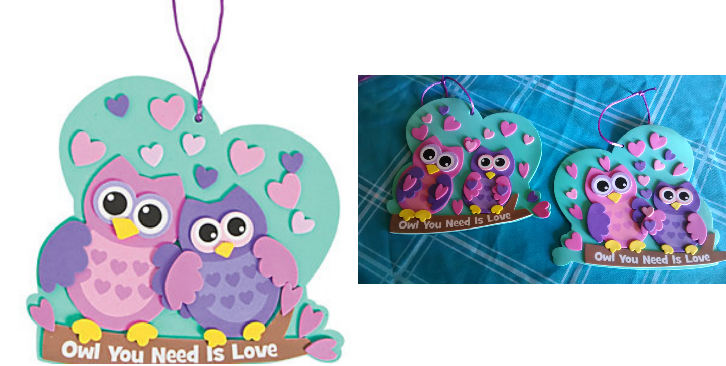 Owl You Need Is Love Sign Craft Kit: This adorable Valentine's Day craft for kids is perfect for classrooms and day cares. 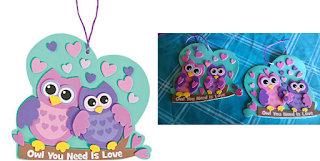 Have them create their own Valentine decoration they can take home and give to mom and dad! Includes self-adhesive foam pieces and satin cord. 7" x 6 1/2" Makes 12. All craft kit pieces are pre-packaged for individual use. Kits include instructions and extra pieces. © OTC How cute is this! I simply loved making this with my kids. My daughter's enjoyed it so much that they made one for each of their grandparents and aunts to display at their homes. I loved it because not only are they super cute but again easy to assemble and easy clean up. 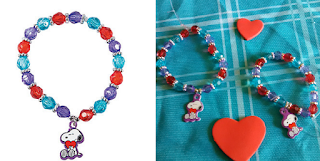 Peanuts Valentine Bracelet Craft Kit: Accessorize in Peanuts® style with this lovable Valentine's Day Bracelet Craft Kit. These DIY Peanuts® bracelets feature eye-catching faceted beads for a sensational accessory kids can wear this sweet season and beyond! 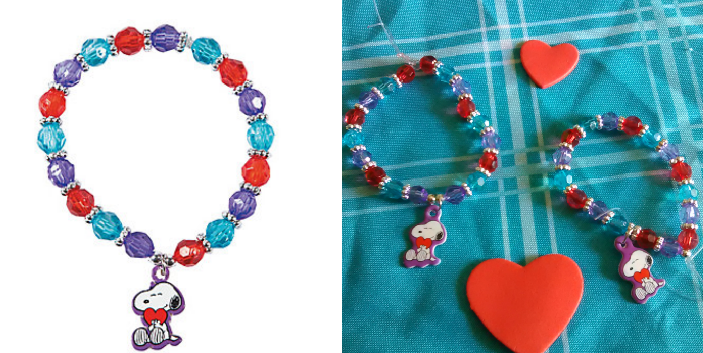 Each handmade bracelet kit includes a 14" stretchy cord, 1/4" spacers and plastic beads and a 1" cardboard Snoopy charm with jumpring. Shop more Peanuts® activities on our site! Makes 12. All craft kit pieces are pre-packaged for individual use. Kits include instructions and extra pieces. Only at OTC / © 2016 Peanuts Worldwide LLC. This is super cute, only thing I will say that I didn't like about it was that the Snoopy is cardboard, I would had been happier if was a metal and sticker on it. I liked that you can make it whatever size you need and that everything was included. My daughters enjoyed doing but had to have a little help because they kept leaving the string down which would make other beads come off. Once we got that they really enjoyed making it and showing it off to friends and family. Peanuts Valentine Gliders: Make your celebration soar when you add our Foam Peanuts® Valentine Gliders to your Valentine's Day party treat bags! They're fun kids' toys to keep the youngsters entertained while the adults enjoy the candy buffet and conversation. 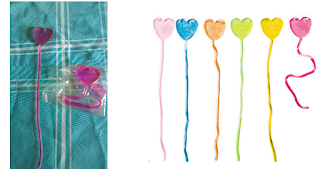 They're also perfect gifts for your child to take to school as alternatives to sugary candy. Take flight with the Peanuts® gang! Foam. (4 dozen per unit) 6 1/2" x 5 1/2" x 1 1/2" Simple assembly required. Only at OTC/© 2016 Peanuts Worldwide LLC Makes a great goodie bag stuffer, super simple and fast to make. Fly great kids had fun with them, have a few in yard from them flying them off their playset. Stuck on You Sticky Hearts: Valentine’s Day is on its way and that means one thing...valentine gifts! 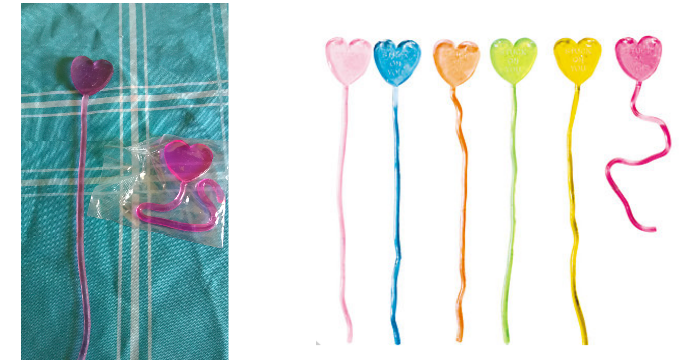 A great toy to include in your Valentine’s Day festivities, these Stuck On You Sticky hearts are just the right size to hide in your goody bags. Kids will love sticking these vinyl toys to walls, tables and more. Make sure and check out the rest of our love inspired toys for more fun Valentine’s Day ideas! (6 dozen per unit) 8 1/2" © OTC Love how many you get! SOOOO many! Can give each child 2 in their goodie bags and a nice assortment of colors. Stick to about anything and come off easily, once they get a little to dirty you can simple wash with water and soap and they will bounce back like new. 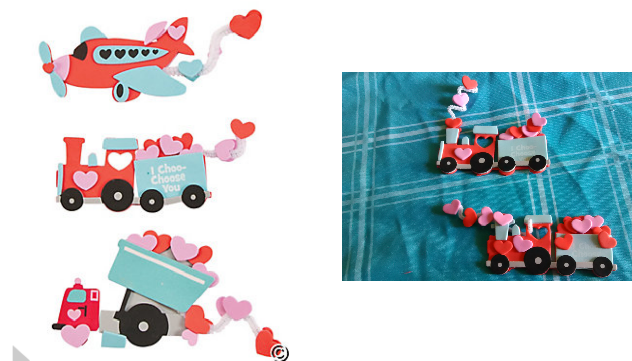 Valentine Transportation Magnet Craft Kit: Transport your love with this sweet valentine craft! These adorable crafts for kids make fantastic Valentine's Day decorations or heartfelt DIY gifts. 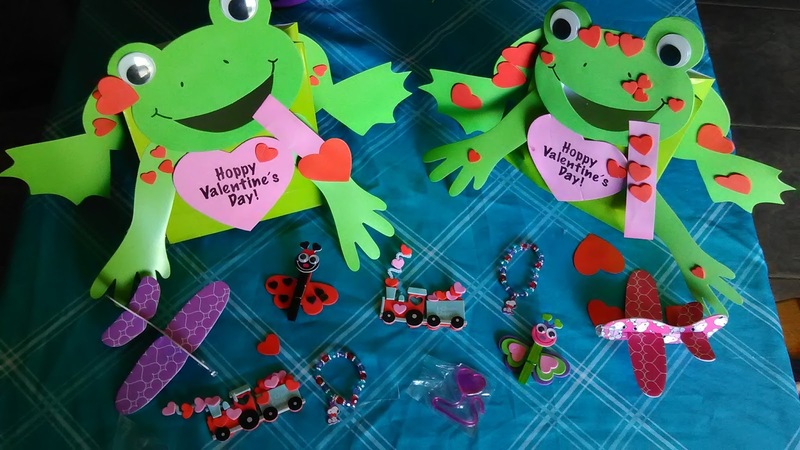 Explore even more ways to make this season sweet with kids' crafts and valentine projects on our website. Includes self-adhesive foam pieces. Foam 4" x 2" All craft kit pieces are pre-packaged for individual use. Kits include instructions and extra pieces. © OTC. I love these! I love that you get to choose which you like. These make a really great goody bag item, I can't wait to share these, with my kids classmates. These are only a .001 of the many many options that Oriental Trading offers for Valentines Day. You can check it all out by visiting Oriental Trading, here. Don't forget all the other reasons to use Oriental Trading, like occasions, birthdays, holidays, and more. Check out my other post about their great products.